On Monday, December 02, 2013, shortly before 4:00 AM, the Spokane Fire Department responded 5 engines, 2 ladders, 1 heavy rescue, and 2 battalion chiefs to a reported structure fire at 717 N Stone. The fire was first reported by a newspaper carrier and was confirmed by SPD officers who were patrolling in the area. The first arriving SFD unit, SE7, reported fire coming from the roof area of a wood constructed one story residence. Engine 7 advanced a preconnect hose to attack the fire while other crews were assigned to gain access, search the structure, connect a hydrant supply line, and advance additional hoses. It was determined that the structure was being used as an office for a business and not as a residence. The fire was extinguished within 60 minutes and crews remained on-scene for several hours extinguishing hot spots. There were no injuries to civilians and one firefighter was transported to SHMC for a knee injury. The fire is under investigation by SFD investigators. At approximately 5:20 AM this morning, December 2, 2013 Spokane City Fire crews were dispatched to 2510 North Denver on a reported structure fire. Fire crews responding to this location reported smoke and fire showing from several blocks away. The first crew on scene reported heavy fire showing from the east end of a duplex at the car port with fire extending into the living space to the west. 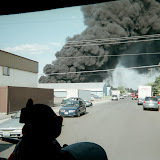 They attacked the fire in the car-port on the east end of the building and protected an exposure building to the south. A second fire attack crew aggressively attacked the fire from the interior confining the fire to the one duplex. Additional fire crews on scene completed search, vertical ventilation and salvage and overhaul. The fire was brought under control within 20 minutes. There were no injuries to any civilians or firefighters and fire crews remained on scene for several hours completing overhaul and assisting in the investigation process. Avista gas and electric crews arrived on scene and removed hazards as needed and Spokane Police assisted with traffic control. The 2-adult occupants of the duplex are currently being assisted by our local chapter of the American Red Cross. There was heavy fire damage to the kitchen, attic and carport of the east duplex with smoke damage throughout the structure. Local 29 Santa Sleigh Coming Your Way!